Background: Protein inter-residue contacts prediction play an important role in the field of protein structure and function research. As a low-dimensional representation of protein tertiary structure, protein inter-residue contacts could greatly help de novo protein structure prediction methods to reduce the conformational search space. Over the past two decades, various methods have been developed for protein inter-residue contacts prediction. Objective: We provide a comprehensive and systematic review of protein inter-residue contacts prediction methods. Results: Protein inter-residue contacts prediction methods are roughly classified into five categories: correlated mutations methods, machine-learning methods, fusion methods, templatebased methods and 3D model-based methods. In this paper, firstly we describe the common definition of protein inter-residue contacts and show the typical application of protein inter-residue contacts. 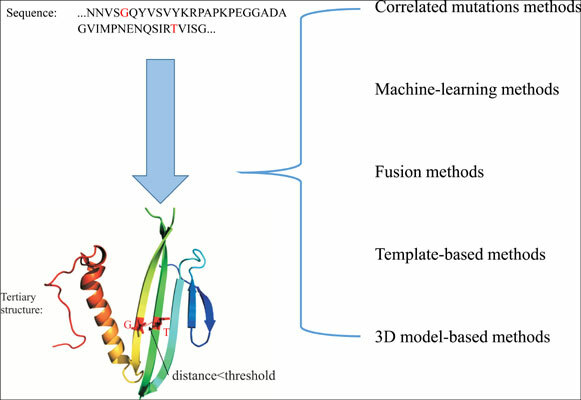 Then, we present a comprehensive review of the three main categories for protein interresidue contacts prediction: correlated mutations methods, machine-learning methods and fusion methods. Besides, we analyze the constraints for each category. Furthermore, we compare several representative methods on the CASP11 dataset and discuss performances of these methods in detail. Conclusion: Correlated mutations methods achieve better performances for long-range contacts, while the machine-learning method performs well for short-range contacts. Fusion methods could take advantage of the machine-learning and correlated mutations methods. Employing more effective fusion strategy could be helpful to further improve the performances of fusion methods. Keywords: Protein inter-residue contacts prediction, protein structure prediction, correlated mutations, residue coevolution, machine-learning, fusion method. Keywords:Protein inter-residue contacts prediction, protein structure prediction, correlated mutations, residue coevolution, machine-learning, fusion method. Abstract:Background: Protein inter-residue contacts prediction play an important role in the field of protein structure and function research. As a low-dimensional representation of protein tertiary structure, protein inter-residue contacts could greatly help de novo protein structure prediction methods to reduce the conformational search space. Over the past two decades, various methods have been developed for protein inter-residue contacts prediction.